TKt48-?, location and date unknown; most probably this is a factory photo. Photo from my collection. 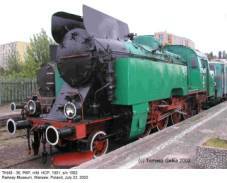 TKt48-36 (HCP 1562/1951) at the Railway Museum, Warsaw, July 23, 2002. Cab interior of TKt48-36; photo taken on September 5, 2006. 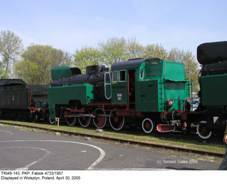 … and the same engine during the ‘Steam Locomotive Parade’ at Wolsztyn depot, April 30, 2005. 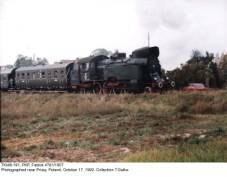 TKt48-191 with a special train near Prusy on October 17, 1992. Photo by Wojciech Szpigiel (from my collection). TKt48-191 once again in action: Chabówka, September 6, 2009. … and the same engine in much better condition, almost exactly three years later (April 30, 2005). 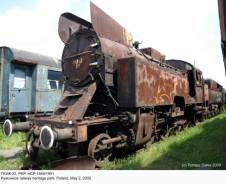 This derelict machine is most probably TKt48-72 (HCP 1663/1951); photo taken at Gniezno depot, September 10, 2004. 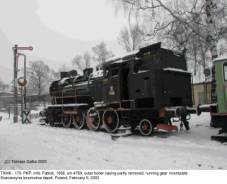 TKt48-179 (Fablok 4769/1956), Kościerzyna locomotive heritage park, February 5, 2003 (note incomplete running gear and removed outer boiler casing). 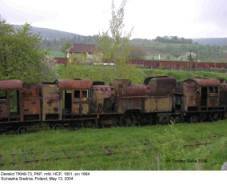 …and just for comparison: a lineup of derelict TKt48s (TKt48-73, HCP 1664/ 1951 in the middle), photographed at Ścinawka Średnia on May 13, 2004. All these engines were scrapped a few months later. … and later that day at the Piła station. Both photographs by Tomek Drzewiecki. TKt48s were popular machines and many are plinthed at various railway premises. You can see some here. Several TKt48s can be seen at the Industry and Railway Museum in Jaworzyna Śląska; you can see some of them here. 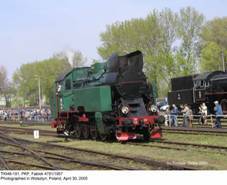 On April 28, 2007, TKt48-18 participated in the Steam Locomotive Parade at the Wolsztyn depot; some pictures can be found here. The above picture shows this engine double-heading a special train with GWR 5521 at the 2008 Show; photo taken on May 3. …both taken by John Bryant on May 27, 2008 (thanks for permission!). 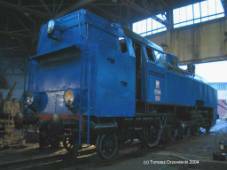 TKt48-23 (HCP 1549/1951) is a part of the TOZKiOS collection at the Pyskowice depot; photo taken on May 2, 2009. 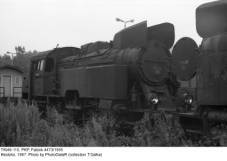 …and one more: TKt48-110 (Fablok 4473/1955). All photos by PhotoGataR (from my collection). Feel free to visit http://photogatar.com to see a gallery of (not only) railway-related pictures. 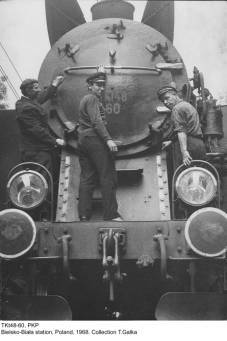 Another picture from my collection: railwaymen posing on the TKt48-60 at the Bielsko-Biała station, 1968. 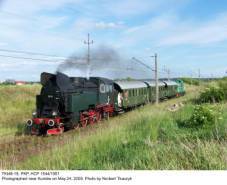 TKt48-18 again, this time with a special train near Kuniów on May 24, 2009. Photo by Norbert Tkaczyk (used by permission). TKt48-152 (Fablok 4742/1956), photographed in Szklarska Poręba on June 19, 1978. Photo by Roman Witkowski (postcard from my collection). 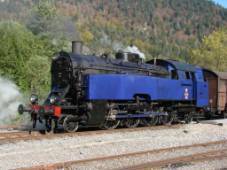 …and the same engine, photographed in Saint-Sulpice, Switzerland, on October 13, 2007. 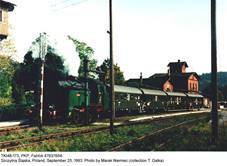 …and TKt48-100, photographed with a special train in Cottbus, Germany, on September 8, 1988 (photo by Martin Stertz). The engine in the background is DR 44 2225-9. TKt48-99 (Fablok 4462/1955) on display at the Kościerzyna Railway Museum; September 23, 2013. THt48-115 (Fablok 4478/1955), photographed in Nowy Sącz on August 1, 1987. Photo by K.Słowikowski (from my collection). TKt48, number, location and date unknown. Photo by Andrzej Żmuda (from my collection). … and TKt48-191 (Fablok 4781/1957), photographed during its visit to Warsaw on June 17, 1995. TKt48-132 (Fablok 4722/1956), photographed in Mińsk Mazowiecki around 1960. Photo by COBiRTK (from my collection). 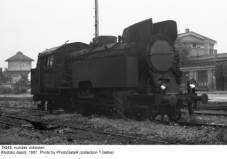 TKt48-64 (HCP 1661/1952) with a local train, photographed near Zabrze on June 10, 1979. Photo by Martin Stertz (from my collection). 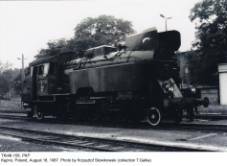 TKt48 was the first new locomotive of Polish design, built for PKP after WWII; earlier ones were either slightly modified pre-war indigenous designs (Ty45, Pt47) or direct derivatives of machines built during the war under German supervision for DRG (Ty42, Ty43). 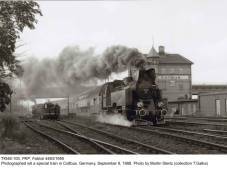 Despite its designation, it was intended mainly for passenger trains. A need for such locomotive resulted mainly from rapidly developing suburban traffic around largest cities (mainly Warsaw and Upper-Silesian agglomeration). 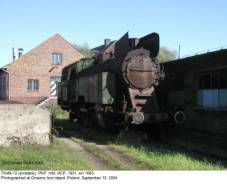 In fact, first European 1-4-1 tank engines were designed for such service. Quite surprisingly, the palm goes to Russian railways, but their class Д (D), later re-classed ЪH, was not successful and all fourteen machines, built between 1910 and 1914, were soon relegated to switching. 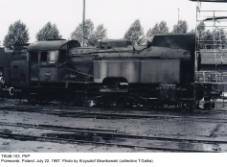 Locomotive of such type was also needed on mountain lines in southern Poland, where a mixture of old machines (classes TKt1, TKt2, TKt3 and Tr6, supplemented by a handful of pre-war OKz32s) had been operated for a long time. These lines were characterized by steep gradients, tight curves and often no turntables at terminal stations. Both these tasks demanded high tractive effort, rather than high speed, and good running qualities in both directions. 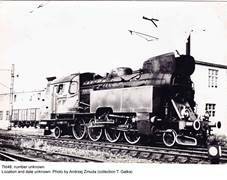 Due to these factors, diameter of drivers was chosen at only 1450 mm, which qualified new locomotive as a freight engine (although pre-war OKz32 had drivers of exactly the same diameter!). In fact it was seldom used with freight trains, at least initially. 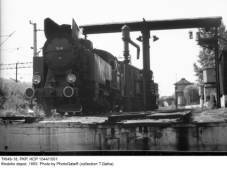 After initial problems with uneasy running (eradicated by suspension modifications and improved Krauss-Helmholtz trucks) and boiler draught, the machine was considered successful. It had first been planned to supply first engines in the end of 1949, but eventually they were delayed by almost one year. 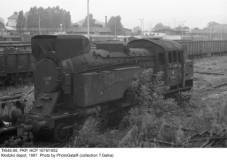 TKt48s were built between 1950 and 1957 by both HCP (Cegielski) and Fablok. First 99 machines (all except eight for PKP) were supplied between 1950 and 1952 and then production was resumed again in 1955. 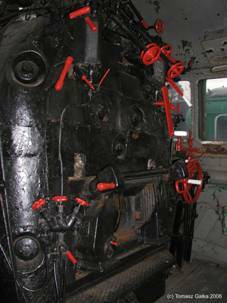 Examples built from 1955 onwards – by Fablok only, starting from TKt48-92 – designated TKt48/2, had some modifications, including wider introduction of welding instead of riveting in boiler design, Trofimov piston valves, slightly enlarged water boxes and fully enclosed cab. Earlier machines were later brought to this standard during overhauls. Many sub-assemblies, accessories and fittings were the same as in older classes, thus introducing some standardization. On this account, some authors don’t regard this machine as an original design, claiming that it was a compilation of various earlier ones. This, however, is certainly an exaggeration. There are some discrepancies concerning the total output from these two factories. According to recent and most reliable sources, HCP built 94 machines, of which 78 went to PKP. Fablok output was 115 examples, all but two going to PKP. This gives a total of 209 TKt48s. 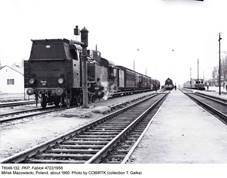 Four HCP-built engines (1681/1952 through 1684/1952) and two Fablok-built ones (2922/1951 and 2923/1951) were sold to Albania. 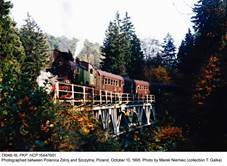 As for remaining twelve machines from HCP, at least three – 1680/1952, 1686/1952 and 1846/1952 – went directly to industrial operators and never served with PKP. According to some older references, nine were sold to Northern Korea, but recent sources (e.g. comprehensive lists by Paweł Mierosławski, published in KDD vol.4/2005) don’t confirm this, giving no details on their destination or future service. Some older sources give the grand total of 199 (102 built by Fablok and 97 by HCP). 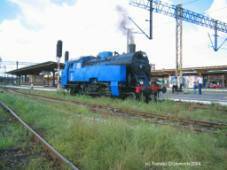 TKt48-191 was the last steam locomotive for PKP built by Fablok. Six Albanian locomotives operated by HSH state railways were designated Class 01 and given service numbers from 01 to 06. 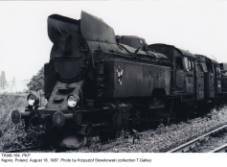 Most probably they were first new locomotives, acquired by HSH after WW II and supplementing a motley collection of old, mostly ex-Italian ones. Details of their service are few. According to Internet sources (www.angelfire.com/ak/hekurudha) two of them – 04 and 05 – were used for switching at the Durrës harbor and one was still there in 1987. The same source reports five machines (minus 01, 2922/1951, broken down and probably scrapped) abandoned in Shkozet, where some of them remained at least until March 2001; a photograph by Geoff Sarbutt, taken in 1992, shows four of them (Geoff has given me the permission to show his photo here – thanks a lot!). Later feedback (again from Geoff – June 2004) confirmed that they survived at least until early 2000s. 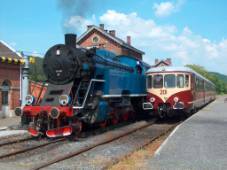 There are some rumors about plans concerning tourist trains hauled by 01s, but no details are available; most probably nothing in fact has been done about it. As it might be expected, details on Korean ones – if there were any – are completely lacking. Most machines – 191 – were used by PKP. 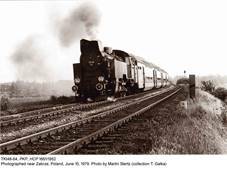 First batch went primarily to suburban lines, while machines built from 1955 onwards were intended mainly for local traffic in southern Poland, where they gave very good service. Polish railways had considerable problems with acquiring a diesel locomotive for local passenger traffic (SP42, developed from the SM42 switcher, was too weak, while SP32, built in Romania, appeared only in mid-1980s, also lacked power and was plagued with failures), so TKt48s remained in that service as the last steam engines with scheduled trains in Poland. According to some sources, last of them were withdrawn from line service in early 1992, but some were reported operational in 1995. 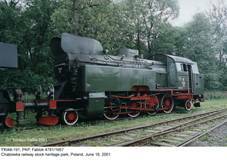 One example, converted for 1524 mm track and based in Elbląg, was for some time used for switching freight and passenger cars built in Poland for Soviet railways, operating on one of the few broad-gauge lines in Poland, between Elbląg and Braniewo. At least six examples were used by various industrial operators, mainly in Upper Silesia; last of them were withdrawn probably in 1996. 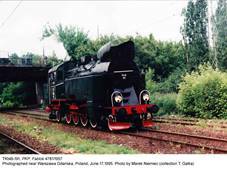 I have detailed information on only one of them: TKt48-1686 (HCP 1686/1952), was used by the Brzeszcze colliery and was still operational in 1986. 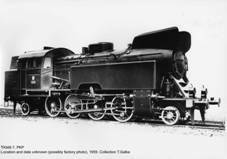 TKt48s were good steamers and reliable engines, characterized by high tractive effort and fast startup. They were popular and very easy to recognize, due to their characteristic silhouette with prominent smoke lifters (these were, however, introduced during service and there are many old photos of engines without them). Many machines have survived until today. A list published in SK vol.2/1999 lists as many as 45 surviving examples in Poland, plus two abroad. Current lists (early 2010), available at www.holdys.pl/tomi, give as many as 36 examples that still can be seen at various locations in Poland. Some are, however, listed as ‘wrecks’; in the meantime, one was sold and eight scrapped. 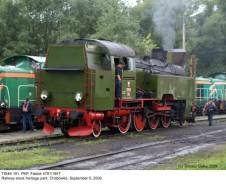 One engine of this type, namely TKt48-191 (Fablok 4481/1957), the last one impressed into PKP service and the last steam engine built for PKP by this manufacturer, now in Chabówka Railway Stock Heritage Park, is kept in working order and sometimes hauls special trains. 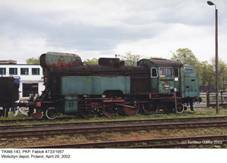 In April 2005 this machine participated in the traditional ‘Steam Locomotive Parade’ at Wolsztyn depot. 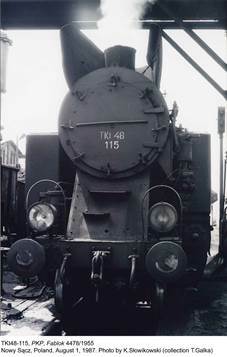 Second engine of this class in working order is TKt48-18 (HCP 1544/1951), property of the Industry and Railway Museum of Jaworzyna Śląska. Cleared for service after a major overhaul in August 2006, it is based in Wrocław and sometimes runs with scheduled trains. 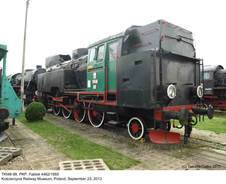 TKt48-179 (now in Kościerzyna locomotive heritage park) has its boiler outer casing partly removed, to serve as a sort of ‘educational exhibit’ showing boiler interior. As mentioned above, three more heritage machines were sold abroad. TKt48-160 (Fablok 4750/1956) is on static display in Oebisfelde, Germany, and TKt48-87 (HCP 1848/1952) was purchased by Le Chemin de Fer á Vapeur des Trois Vallées, Treignes, Belgium; some sources claim that the Belgian machine is in fact TKt48-67 (Fablok 2926/1951), which is not true. 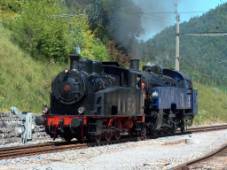 TKt48-188 (Fablok 4778/1957, recently used by the railway stock repair establishment in Łapy) was purchased by Vapeur Val de Travers of Switzerland and overhauled by InterLok company in Piła. Rolled out in August 2004 with slightly lower cab and removed smoke lifters (due to different vehicle gauge), in new blue livery, it underwent tests in Poland before departure to Switzerland. In the meantime, some railway fans were lucky enough to take photos (one of them was Tomek Drzewiecki; you can see two of his pictures here – thanks for permission! More can be found at www.parowozy.strefa.pl). - Tomasz Drzewiecki and Yves Godrie (private communication – thanks for the photos! ).